Our daily transportation decisions have major impacts on our personal health and the wellness of our communities. Places that design streets to encourage walking and biking inevitably get people active and out of their cars. A robust transit system encourages good public health because it gets people walking to bus stops. Buses also help us breathe easier. They produce 95 percent less carbon monoxide, 92 percent fewer volatile organic compounds, and 45 percent less carbon dioxide than private automobiles, according to the American Public Health Association. Thankfully, Lebanon residents have many options to use public transportation or take a safe walking or biking trip. Advance Transit provides frequent connections to places to shop, work, and play throughout Lebanon and the Upper Valley “core” towns. Need to get to Dartmouth Hitchcock for work or an appointment? Advance Transit’s Blue Route provides a quick, fifteen-minute ride from Downtown Lebanon an astonishing thirty times per day. Perhaps you want to get into downtown Hanover to walk around and do some shopping. Hop on an Orange Route bus in front of the Kilton Library, and you’ll be there in ten minutes. If you’re commuting into Lebanon from further away, you might be able to use a longer-distance bus to get to work. Connecticut River Transit provides rides from communities along I-91 south to major employers, including Dartmouth Hitchcock, Dartmouth College, Hypertherm, Fuji-Dimatix, and the VA Medical Center. Stagecoach provides similar services from I-91 North and I-89 North in Vermont. If you feel tired and stressed from a long commute, chances are a bus ride could help you feel more relaxed and ready for your workday. Lebanon’s resources for biking and walking are getting better each year. 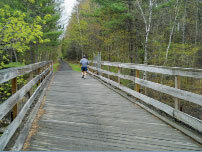 Area residents have for years enjoyed the Northern Rail Trail, an off-road biking and walking path that runs from Lebanon through Enfield to southern New Hampshire. Now, the City is working to extend this trail into West Lebanon through the Mascoma River Greenway project. This exciting, four-mile project will run all the way to the Vermont border and provide approximately half of Lebanon residents a connection within a mile of their homes. 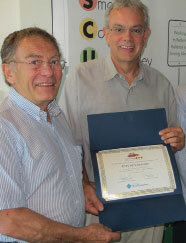 Erling Heisted and Clif Below accept on Lebanon’s behalf the 2013 Transportation Project of the Year award from the Upper Valley Transportation Management Association at Vital Communities. To the north of downtown, the Mount Support multi-use path provides a safe way to access Dartmouth-Hitchcock Medical Center, Lebanon High School, Timberwood Commons, and other residential areas. Paved in 2012, the separated path gives cyclists and walkers an option to go north and south in the Route 120 area without having to travel on the four-lane state highway itself. Advance Transit has also adjusted its Blue Route to accommodate the new residential developments along Mount Support Road. These many improvements have not gone unnoticed. Last year, the Upper Valley Transportation Management Association recognized the City of Lebanon as the winner of its “Municipal Project of the Year” award, saying Lebanon received the award for many projects that are helping to build a strong transportation network. Continue to look for great new ways to bike, walk, and take the bus around Lebanon – the city is on the path to a great transportation future! 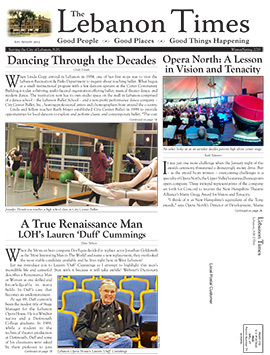 The Lebanon Times is delivered to every mailing address in Lebanon.